She loved it. She calls her bad eye her “spartan eye” because it keeps getting stronger and spartans are strong. So naturally, I thought this was adorable, so I posted this same picture on the Spartan Parents Facebook page. 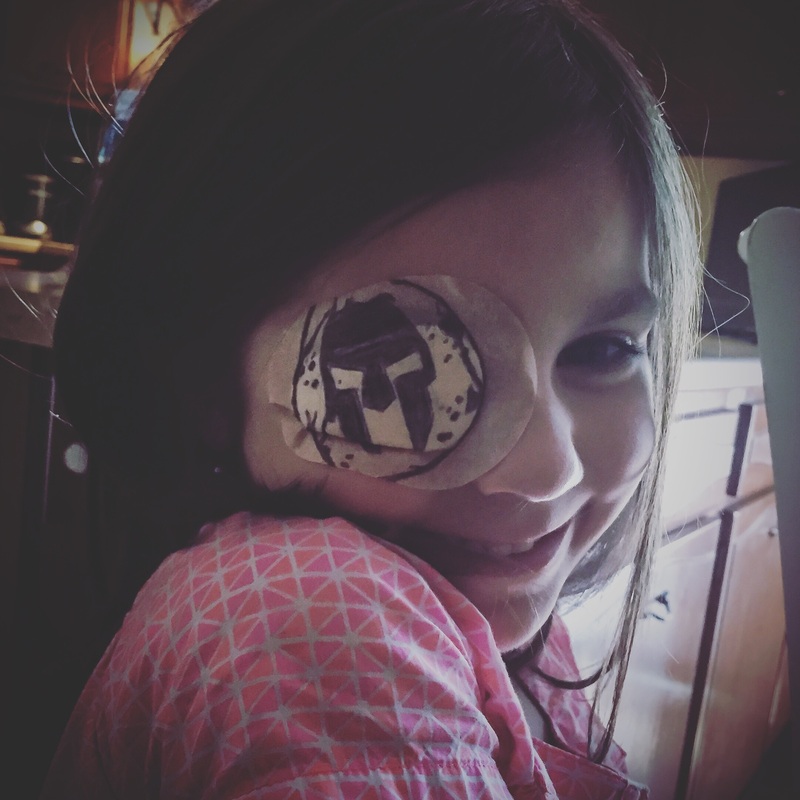 One mother saw Jocelyn’s picture and commented that she had a 6 year old daughter who had optic nerve hypoplasia and she struggled with her patch too. She said that she hopes I didn’t mind if she showed the picture of Jocelyn to her daughter because her daughter felt “different” and seeing her would mean a lot to her. So of course I said, ABSOLUTELY, DO IT! I immediately told Jocelyn this story. I told her: There was a mommy of a little girl named Addison that saw your picture. Addison has to wear a patch too because she has a bad eye. Her mommy wants to show her your picture so she can see that wearing a patch can be cool and that she doesn’t have to be scared or afraid to wear one. Because you are being so good and wearing YOUR patch, you are helping her wear HER patch so her bad eye can get stronger too!!! Jocelyn thought that was the coolest thing. Then Jocelyn showed her spartan heart. She asked me, “Can I make a video for Addison so I can tell her to wear her patch so her eye can get stronger like mine?” My heart melted. I asked her what she wanted to tell her. I only wanted her to tell me so that she could practice what she was going to say in the video. I pressed record and I heard, “ummmmm….” with a really long pause. I said, “it’s ok, don’t be nervous, just talk to Addison and tell her what you were telling me. I’ll start over and we can try again.” So I pressed record again. This was the result. I teared up. Here I am, reading this little message with tears streaming down my face. Not because of anything I did, but because of how proud I was of Jocelyn. Yes, my daughter has a bad eye, but she has the most awesome heart in the world. Nobody wants to feel alone. Today, she made Addison’s day, all by herself, just by being her. She showed her that she is not alone and it’s ok. This morning Addison sent a return video to Jocelyn. She was so happy to see Addison. She keeps watching it over and over. I don’t know what anyone who reads this is dealing with. Maybe someone reading this is dealing with a disability, or a difficult situation, or struggling emotionally somehow. Jocelyn and Addison showed me today that your situation doesn’t have to define you. You can define your situation. As adults, it’s easy to feel down on ourselves because things aren’t going the way we’d like. You never know who you might help along the way when you help yourself. Your difficulty could become your biggest testimony. Please share this post and follow this blog for the newest posts from Spartan Daddy.